How many times have you heard someone tell you to be realistic? Those people you talk to about your plans to create a business or about a career or personal goal? Often times they are people who maybe mean well, but probably gave up on their own dreams and goals. Now they are advising you out of their own fear or failure. If you find yourself listening to them...you slowly start to look at your goal as unstable or maybe even unattainable. It’s important to know who we are talking to when we share goals and dreams. Are these people successful? Have they met a goal or dream of their own? If not, maybe they aren’t they aren’t the best person to talk to about what you desire. Learning what and when to share has been on one of the most valuable lessons I’ve learned. I remember sharing goals with associates and even family members who quickly shot them down. They had questions and comments like “how are you going to do that?” or “there are a lot of people trying to do the same thing”. They would follow up with “I’m just trying to help” I had to realize it wasn’t about me, it was about them and their inability to dream big. . The reality is when you have a goal it’s your goal and you shouldn’t concern yourself with anyone else who may be trying to do the same. You have to focus on you. You don’t have control over anyone else. The people you share with will either encourage or discourage....and you should be weary of the ones who say nothing at all. If you engage with naysayers they can kill your spirit and your enthusiasm. People who want to see you do well will offer thoughtful advice....but you’ll still feel positive. You have no doubt when you have had a negative or discouraging conversation...you walk away feeling deflated. When the negativity comes from people you are close to, often times you wonder if what you’re feeling is true. It is....you can’t deny it. Acknowledge it and know that maybe that person is not someone you can share with in the future. There’s nothing wrong with constructive...but you get a feeling in the pit of your stomach when it becomes destructive. You cannot let the negativity get into your heart...that’s dangerous. Let it go and reset your mind. When I look at people like Oprah, Bill Gates, Steve Jobs, and Steve Harvey their underlying theme is always “ surround yourself with positive people”. Big dreamers need good support. If not, you become crippled by the naysayers....especially if they are close to you. You must stay focused on your goal and stay the course. The goal is to succeed, but you can’t do that if you never try. Get rid of the negative voices around you. 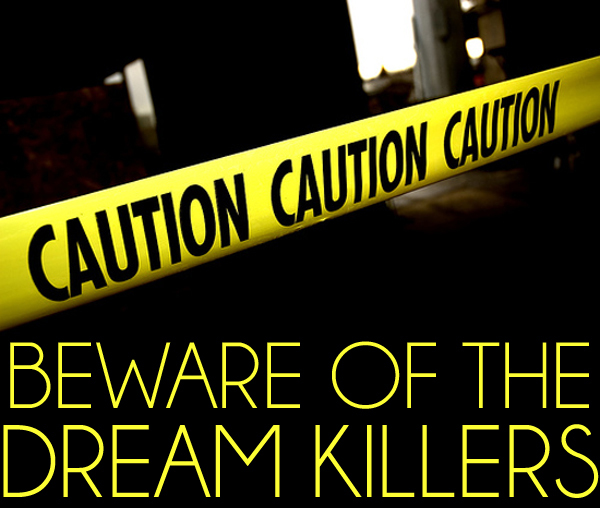 Some people just can’t handle your dreams and that’s ok. They belong to you.